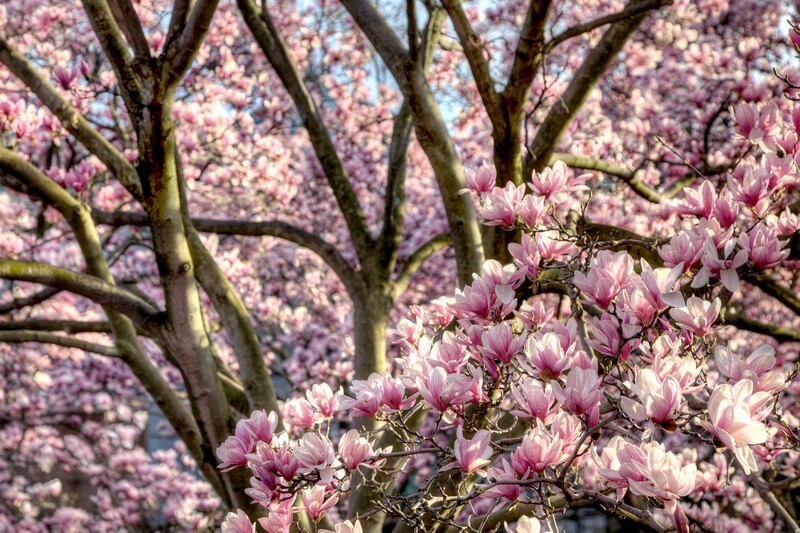 You know how I always say that the Enid A Haupt garden is my favorite place to see Magnolia trees in Washington DC? Well, I know my second favorite place now. 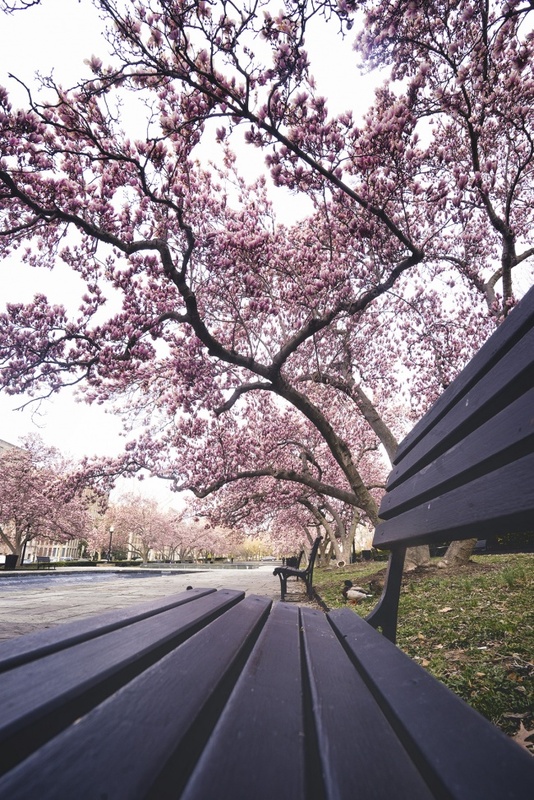 It’s Rawlins Park located in Foggy Bottom and pretty close to the White House. It was my first time visiting this park but I drive past it all the time. I never really paid any attention to it until my friend, Zack told me about it. Holy cow, how long have I been missing out on this magical place? I love how the whole park is lined with Magnolia trees. So on a very grey morning, my friend, Laurie and I went to photograph the park. It’s not very big so we managed to walk around and captured it all within 20 minutes or so. 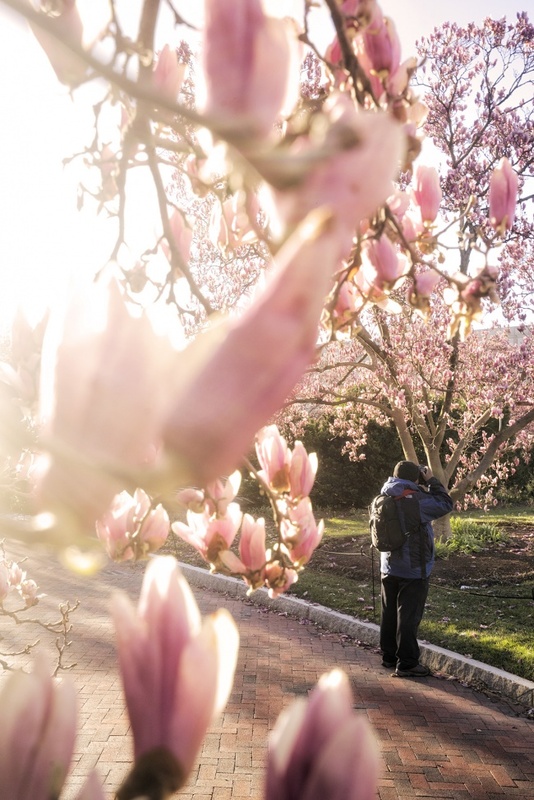 The park has been really blossoming so tons of other photographers in the area have been shooting it too. In order to find a unique perspective, I just stuck to what I knew. Get low and always look behind you. I love the leading lines the park bench create to look down the row of benches and even the arches the the Magnolia trees create. The fun added bonus was that there were these random ducks just walking around. HAHA. This little guy had an injured foot unfortunately. I really wished there was something I could have done to help him. So Enid A Haupt is my favorite just because they have so many more trees but Rawlins Park is just as beautiful but a little bit smaller. To be honest though, there will probably be less people wondering around at Rawlins Park than Enid A Haupt. My camera settings for this image is F9 at 1/20th of a second at ISO 160 with my Sony A7II and 16-35mm wide angle lens. As I was sitting here looking at this image, thinking about what I wanted to say on this blog post, Andrew walked over to my computer screen and pointed at the image. This is unusual because he said , “Hey, that’s nice!” It’s unusual because Andrew doesn’t always like my images. I’d say about 50% of the time he doesn’t like them. It’s all good though. Because 50% of the time I don’t like the shirt he’s wearing. LOL. Just kidding. I appreciate his honesty. I rather him tell me what he really thinks of my images then him lying to me and always trying to please me. But seriously, what’s not to like about this image? It’s like you’re being showered in pink petals and I love it. 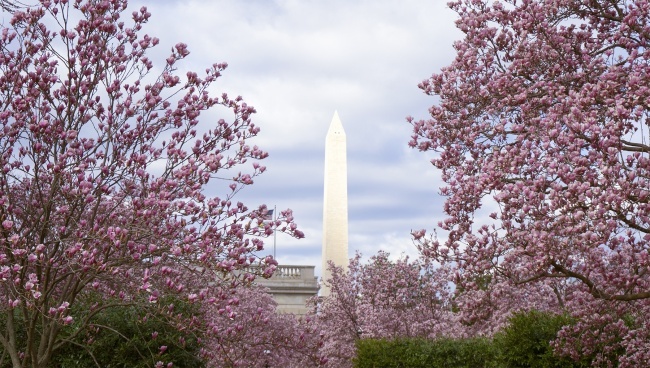 I love the magnolia trees that pop up all around Washington DC in the spring. And if I’m being honest, sometimes I think I like them a little more than the Cherry Blossoms just because they’re so much bigger and more abundant. It’s also nice because you don’t have to fight the crowds to photograph them either. But this view of looking up at them is my absolute favorite. The curves in the branches are so interesting. These particular trees are located behind the Smithsonian Castle in the Enid A Haupt Garden. 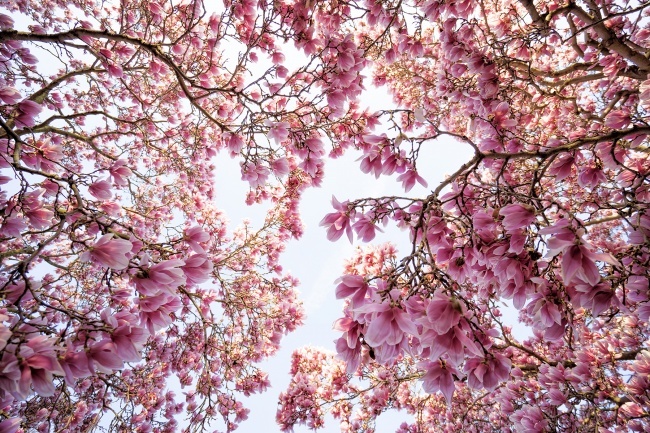 My favorite place to photograph magnolia trees because there are just so many of them in one location. Now that I’m thinking about it, forget what I said earlier this week about the snow. I’m ready for the flowers! My camera settings for this image is F4.0 at 1/160th of a second at ISO 200 with my Sony A7II and my 16-35mm wide angle. The wide angle lens was key so I could get as much as of the flowers in one frame as possible. Did you watch the vlog I uploaded last week of the Yayoi Kusama Infinity Mirrors exhibit? At the very end of the video, I was behind the Smithsonian Institution Building (otherwise known as the castle) in the Enid A. Haupt garden. This image depitcs what was distracting me from what I was talking about. I had walked over from the Hirshhorn Museum and I don’t know why but I’ve never seen this view before. Maybe it’s because the magnolia trees weren’t bloomed or I have never walked through that particular entrance before but it literally stopped me in my tracks. The mid day sun was hitting the monument so perfectly. The flowers were looking so pink and beautiful. It was the perfect morning to take a little bit of time and appreciate these beautiful flowers. It really feels like spring is in the air and it’s here so early in the year. Here’s to hoping we have beautiful sunrises and sunsets, moody mornings, calming afternoons and no wind! Wind is pretty much the death of the cherry blossom flowers. This shot was taken in the Smithsonian Castle Gardens a hidden gem that not many know about but has fantastic blooms!